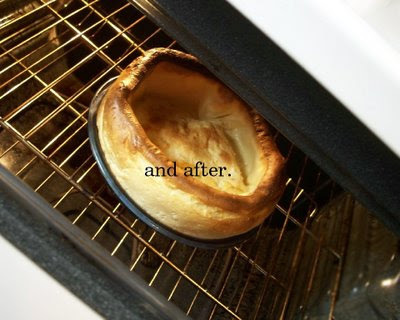 little momma and company: just a little dutch baby. 15 minutes before baking, preheat your oven to 450. Have a pie plate ready.Whisk together milk, flour, eggs, sugar, and vanilla. 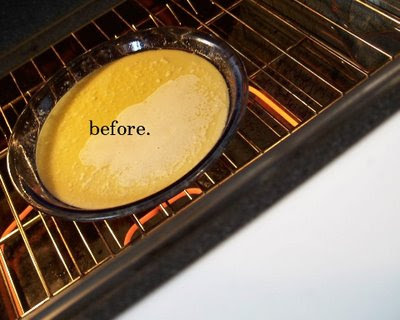 Put the butter in the pie plate and place it in the oven to melt. When butter is just melted, brush the sides of the pie plate with it so the pancake will not stick.Slowly pour the batter into the hot pie plate. Bake it for 20 minutes. Reduce heat to 350 and bake for another 8 to 10 minutes, until pancake is well browned. Remove from oven and spoon fruit into the center of the pancake. Top with powdered sugar. Enjoy! love making this for breakfast, looks so good! Speaking of fancy...look at your cool links! Leigh's got a cool feature on her blog, too, where you can click vote on each post. One of these days maybe I'll bedazzle, too. My FAVORITE Emily recipe :) We eat these alllll the time thanks to you!!!! Thank you Thank you!!!!! Happy 4th! I'm finally getting caught up on blogs and oh how I've missed yours and your creative, inspiring genious. You truly inspire me to be a better mom and wife. I totally need to make this amazing concoction- looks delicious! I love you recipies!! We've done the suckers and the playdough cookies. I'll be trying this one too. It looks beautiful! How funny is it that I have been thinking of making just this very same thing lately and then I get home and see that you blogged it!? I shall just have to make your recipe and give you a solid review! Beautiful pictures, as always! that is a favorite in our house, and a quick dinner when I'm pooped!I've got to try it out with the fruit! So delicious! I had this for the first time @ Original Pancake house last weekend and may just have to try making one now! This looked so delicious I made it but for some reason was doughy in the middle and not toasty like yours. Do you have any idea what I could have done wrong? It was gooey yet yummy.